I had the pleasure of reading another Emma Campion (Candace Robb) novel recently. 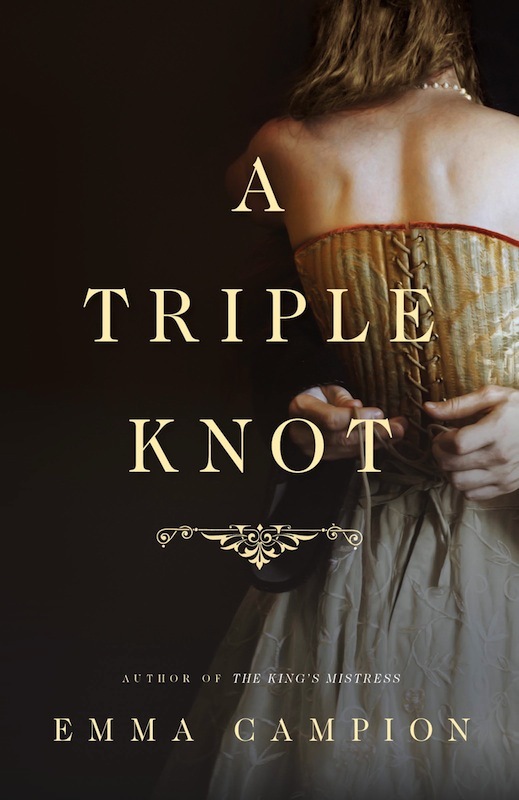 Campion, who has written extensively about Alice Perrers, the royal mistress of King Edward III, in her hit, The King’s Mistress , is back on the shelves with a new book released this month entitled: A Triple Knot . This time, she’s telling the story of Joan of Kent’s life and loves in fourteenth century England. What started her infatuation with Joan? The burning question of why Joan of Kent chose to be buried with her first husband, Sir Thomas Holland, 1st Earl of Kent, instead of her second husband, Prince Edward, also known infamously as “The Black Prince”. Joan of Kent had a rather tumultuous love life to say the least making it easy to see why Campion selected her as the protagonist for this book. She was wed clandestinely to Sir Thomas Holland, a well respected knight and commander of King Edward III’s during the Hundred Year’s War. When they wed in 1340, Joan was just twelve and he was twenty-six. To many, Holland’s move seemed predatory. While he was away campaigning, Joan’s family, obviously unhappy with her decision to marry Holland without permission, forced her to marry William Montacute (Montague). Their marriage was a political alliance made to strengthn the crown and from all accounts, completely miserable. Campion insinuates that William was gay and sleeping with his pages, and that he was abusive to Joan. I couldn’t substantiate these claims but they made for an interesting plot twist and explanation of why they had no children and the marriage failed. Joan apparently agreed to this marriage only to spare Thomas from the executioner’s axe. After nine years of waiting to be with Joan, Thomas was able to collect enough money, and build a solid enough reputation, to petition the Pope and restore her as his rightful wife. Joan and Thomas appeared to have a happier union as she bore him four children (Thomas, John, Joan and Maud) in the eleven remaining years they had together before Thomas’s death at age forty-six in 1360. There is, however, another darker side to this seemingly happy tale. This tale of true love is often marred by accounts that the Edward, the Black Prince, always loved Joan and waited for Thomas to die so that he could take her as his wife. Joan and Edward were first cousins, which complicated the matter because they were related in a prohibited degree (consanguinity – “blood relations”) so technically, they could not be married. The Black Prince managed to do away with that pesky obstacle by getting dispensation from the Pope to marry his first cousin. Edward’s parents had always been opposed to this union. They were concerned because of Joan’s reputation, and the reputation of her father – Edmund Woodstock, 1st Earl of Kent, who was executed as a traitor for supporting his elder half brother, Edward II against Queen Isabella and her lover, Roger Mortimer, 1st Earl of March. After his execution, Joan and her family were placed under house arrest and Edward II took it upon himself to raise her in his household alongside his eldest son, the Black Prince. Joan was always viewed as a potential threat by the royal family and Edward’s insistence at having her as his wife was problematic. To further cast aspersions on Joan’s character was the fact that she once again entered into a clandestine marriage, this time with Edward, very quickly after Holland’s death. Did Joan really love Holland? Was she also in love with Edward? Was she forced to marry Edward out of fear when Holland died? What was the real story? Campion’s book explores these very questions and proposes an interesting take on where Joan’s affections truly lay. I’m not big on romance – really, I’m not, but this book is romance done right. It’s an interesting take on Joan’s tempestuous love story. She is often villanised and portrayed as a woman who toyed with powerful men’s affections to secure her own ends. Campion has a soft spot for maligned madams as she also did a similar positive spin on Alice Perrers in The King’s Mistress. She seems to like resuscitating the reputations of (in)famous medieval women. More power to her – the spins are plausible and fun to read. This book outlined the struggles Thomas and Joan endured to be reunited but without getting overly syrupy and cheesy. It gave the reader a glimpse into the difficulties of politics, marriage and royalty. Royalty did not give women the freedom to marry or fall in love in the manner we are accustomed to in this day and age. Medieval royalty were bound by duty, and politics. Life for royal women like Joan was more like living in a golden cage. The English royal family is a great place to place a novel as there is plenty of intrigue, backstabbing and fodder for a novel or two. I liked Joan and Holland’s characters. I found the Black Price to be an equal mix of dislike and pity. I think that’s exactly what Campion hoped to get out of the reader, that sense of confusion over Edward. Love/hate and everything in-between. Edward struggled to be good to Joan but he did some pretty horrible things to her over the course of the book that made it difficult to ever fully warm up to him, all the while, the reader could still see his true love for her. William Montague was utterly loathsome. He was a character you’re not supposed to like or sympathise with on any level so Campion successfully did her job there as well. Any negatives? There is not much fault I can find with this novel. My only comments here would be that the other characters in the book, like Bella, (Edward’s sister) Efa, (Joan’s maid), Thomas’s brothers, and Lucienne (Thomas’s lover), were fine for filler but they never really jumped off the page for me. The real meat of the story was the love triangle of Joan, Edward, and Thomas. They dominated the book and made it a great read. I also think that the book could have stopped sooner as it seems like you’re moving into a new book towards the end when Thomas passes away and Joan rekindles her relationship with Edward. I felt like that could’ve been saved for a new book just about Joan and Edward’s relationship. This book was more about Thomas and Joan, than Joan and Edward so ending it after Thomas died would have been a better cut off point. It kind of kept going after I felt the real story had ended. All in all, I these are minor personal preferences and the book remains a fantastic story. A Triple Knot is another good book coming out of Campion’s repertoire. If you enjoy Medieval English history, a little love, a little intrigue and a lot of drama, then pick up this book. Campion does a brilliant job of giving us alternate explanations for famous historical personalities; the medieval “celebrities” of the day. She gives the reader pause to think of them in another light and questions our preconceived notions of what motivated their actions. She posits the “what if?…” scenarios we all have and answers them convincingly. This is a compelling romance that isn’t over the top, and a good place to start for those of us who aren’t exactly big romance readers. Campion is a skilled author and superb storyteller. if you’re looking for history presented in an interesting and captivating manner, this book is should definitely be on your reading list this summer.